Gather round, lovelies, and I will tell you a story. It's a story about my first storytime*. As the day approached, I put my storytime together. Based on my love for the story Cloudy With a Chance of Meatballs***, I put together a food-themed storytime. I pulled some books to use, including The Beastly Feast by Bruce Goldstone and The Very Hungry Caterpillar by Eric Carle. One of the librarians with which I was working pointed me to a Very Hungry Caterpillar puppet they had (and I thought "What? I don't just read books? I have to do other things?"). I was ready! I had my storytime books picked out. I had practiced using the puppet. I had my display books picked out. I was ready! And... I was nervous. Like, incredibly nervous. Like... for a week beforehand, I had trouble sleeping because I was so nervous. The librarians at MCPL kindly went over my books with me and gave me their tips. But I was still nervous. The fateful day came. I was probably ridiculously early to get everything all set up. The program room had a door that we would keep locked until we opened it up to start the program. About 15 minutes before the start time, kids started rattling the doorknob. I briefly considered just leaving the door locked and gettin' the heck out of there, but my supervisor was waiting to observe my program. I took a deep breath. I took another deep breath. And I opened the door, let the kids in, and started my first storytime. You know what? It was fine. I didn't have any problems with crowd control. 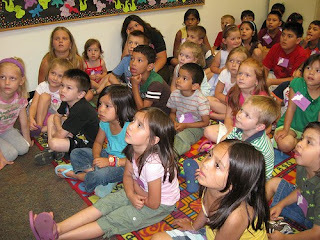 The kids enjoyed the stories and I was able to keep their attention. They checked out books after the program and one kid asked me how caterpillars turn into butterflies (I stammered something like "You know, I bet we have a book about that! Go ask at the reference desk!"). And then it was over. And I was still alive. Now, the thought of being that nervous over a simple storytime is funny to me****. My first storytime wasn't earth-shatteringly awesome, but it was fine. And I've learned something with every storytime I've done since. Now, four years later, I feel like I can pull together a storytime with a fair amount of ease. I have a collection of readaloud favorites and I have a better grasp on what makes a book a good choice for storytime. The point of this story is that my first storytime was not easy. And it took me probably at least a dozen or more storytimes and programs to feel somewhat comfortable doing it. But it does get better. Whether you come down for or against the requirement for an MLS degree, I think we can all agree that librarianship is something that gets easier with practice, with experience. Just remember that even the best librarians started somewhere. So, if you've yet to do a storytime... or if you've done a couple but still get the butterflies beforehand... just rest assured that it gets easier. Keep doing it and someday you'll look back and laugh at all those sleepless nights. * Okay, when I was working at the Big Corporate Bookstore, I did my share of storytimes, but those do not count because I did not know what I was doing and very few kids ever showed up and nobody cared if they were any good. And they were not good. *** This was 2006 - long before the CWACOM movie came out. Just sayin'. **** Although, when I am stressed out at work, I will occasionally have a nightmare that I have to do storytime and can't find any books I want to use or can't remember the words to a song we're singing. And usually there are 100 or so kids waiting for me to get my act together and do the program. Other librarians have those dreams sometimes, too, right? RIGHT? Photo from Franklin Park Library, used under Creative Commons license. thank you so much. i am a librarian and i love my job: i love the books; i loe the kids, i love the readers' advisory & reference. but storytime, ahhh! nothing gives me more anxiety. i am shy by nature and it has taken enormous effort for me to overcome my fears to do storytime. i appreciated hearing that someone else has struggled with the nervousness because it often seems like many people are so confident and comfortable. what helped me today (my program just ended 30 min. ago) was focusing on the kids and their experience of it. i wanted it to be fun for them and that helped me take the focus off my own silly fears. thanks again for sharing.